Its been a year! A year since I came to Delhi with loads of apprehensions of leaving lovely Bangalore behind and venturing out to a city that is not very popular as a place to live. A year ago, despite most people telling us that moving to Delhi was a foolish err move, we moved. But then in the words of Hunter Thompson - "Buy the ticket, take the ride". The first week was a little unnerving to be honest, but we got into the groove pretty soon. 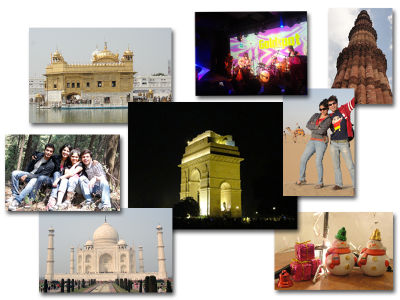 After a year here, I can tell you, Delhi is an awesome place. It's got a bit of everything and everything in its extreme. Though there is some more time left before I leave this city, I am sure that in the years to come when I do look back at Delhi in nostalgia, it will definitely be for its uber-cool winters(the all-day fog, women dressed in their winter best! ), for the awesome Goldspot concert we attended at Blue Frog, for night long drinking sessions followed by breakfast at 'American Diner', for meeting Ruskin Bond in Mussoorie, for watching the sun out of a solar telescope from an observatory in Nainital (it's an very funny anecdote so ask me next time you see me), for the hilarious fight we got into at Jaisalmer, for our drive to Lansdowne, for the unexpected lake and monuments in Hauz Khas village, for falling off a camel at Pushkar (not a proud moment), for attending an all night wedding, for the unforgettable train journey to Rajasthan in a sleeper compartment during Holi, for the aloo tikkis, the kakori kababs and the kulfi faloodas, for the loud and colourful Rajouri and the oh-so sophisticated South Delhi, for playing mafia on the entire train journey back from Amritsar, for attempting to make a short film by traveling all over Delhi, for jumping off a cliff into the Ganges in Rishikesh, doing the most random dance at a friend's 'Sangeet' party and for a million more things that don't come to mind right away! It's been an awesome ride so far and there's lot's more to come. So stay tuned ! Labels: Thinking Cap, whats up? oh man!!! i almost went all around the place reading your blog! u guys truly rock ! !